Osgood Schlatter disease or Osgood Schlatter lesion is a very common cause of knee pain in children between the ages of 10 and 15 years old. It was named after two physicians in 1903, Dr. Robert Osgood and Dr. Carl Schlatter. Early diagnosis and appropriate treatment, especially rest, is essential as this injury can be stubborn to treat if left. Osgood Schlatter knee pain is usually localised to a specific point at the tibial tuberosity and is therefore fairly easy to diagnose. 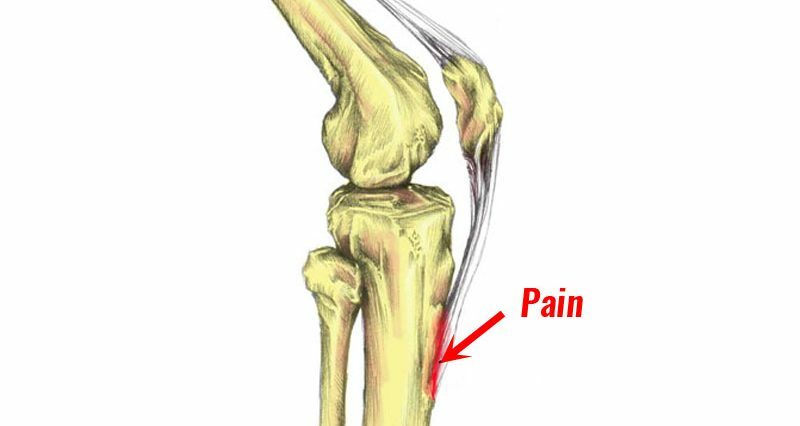 Tenderness and pain will be felt at the tibial tuberosity and will get worse during exercise, particularly weight-bearing or impact type exercise such as running, football, jumping, basketball, and similar sports. Pain will also be worse after exercise. The athlete is likely to experience pain when contracting (tensing) the quadriceps muscles when the leg is straight or performing squat exercises. 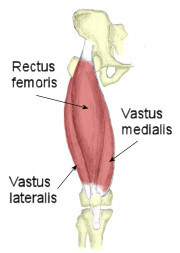 In particular, a single leg squat is likely to reproduce symptoms. The tibial tuberosity may become swollen or inflamed and may even become more prominent than normal. There is likely to be locallised swelling over the lower front of the knee and inflammation of redness may be seen. If the athlete has suffered for some time then they will likely have atrophy (wasting away) of the quadriceps of thigh muscles. In extremely severe cases they may do an X-ray to see exactly how much damage has occurred. It is possible for Osgood Schlatter disease symptoms to come and go, becoming more or less severe, sometimes for no reason. It is a good idea to keep a training diary monitor training activity and symptoms to identify if any particular training methods worsen the injury. 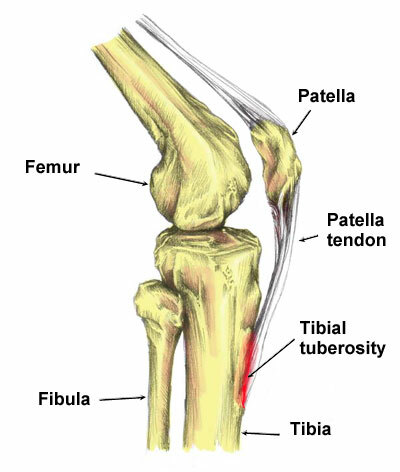 The patella tendon (or patella ligament as it is sometimes called) connects the bottom of the kneecap (patella) with the shin bone at a bony protrusion called the tibial tuberosity. Osgood Schlatters Disease is a painful reaction at the point where the patella tendon inserts into the tibia or shin bone. Over time it can become progressively worse as tendon pulls at the growth plate at the top of the tibia. With repeated trauma new bone grows back as part of the healing process which causes an obvious prominent bony lump felt at the tibial tuberosity. As the young athlete’s bones grow quickly, it can take some time for the muscles and tendons to catch up. If the muscles have not yet adapted to the length of the bones, then this can result in additional strain being placed at the point where the muscle attaches to the bone (via the tendon). This is frequent in younger people because their bones are still soft and are not yet fully grown. Expert interview: Sports physiotherapist Neal Reynolds explains Osgood Schlatter disease. Osgood Schlatter syndrome is primarily an overuse injury although certain factors can increase the likelihood of sustaining this condition. Age – It is more likely to affect boys aged around 13 to 15 years old than girls, although girls certainly can be affected and if they are it is more likely to occur earlier at about aged 10 to 12 years old. it is often put down to growing pains in knees. Obviously, this is a general guide and ages can vary. It occurs due to a period of rapid growth, combined with a high level of sporting activity. Osgood Schlatter in adults can occur, especially, if it has not been treated properly during the teenage years, but is rare. Activity – As the young athlete’s bones grow quickly, it can take some time for the muscles and tendons to catch up. These changes result in a pulling force from the patella tendon, on to the tibial tuberosity at the top of the shin. This area then becomes inflamed, painful and swollen. This is frequent in younger people because their bones are still soft and are not yet fully grown. It is seen more often in children involved in running and jumping activities which put a much greater strain on the patella tendon. Other factors which may increase the likelihood of suffering from Osgood Schlatter Disease include biomechanical problems with the foot and lower leg such as overpronation. This is where the footfalls in or flattens too much which in turn causes the lower leg to rotate and additional forces placed at the knee. 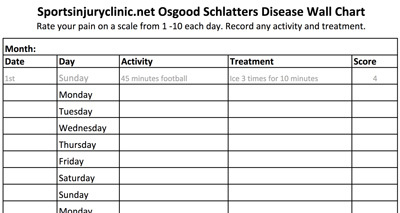 Treatment for Osgood Schlatters disease consists of reducing pain and inflammation by applying the PRICE principles of protection, rest, ice, compression and elevation along with longer-term managing the condition through training modification and educating the athlete or parent until the young athlete grows out of it. Immediate first aid and the best way of relieving symptoms is applying the PRICE principles of protection, rest, ice, compression, and elevation. Protection of the knee from further injury can be done by wearing a patella knee strap or patella tendon taping technique. A patella strap or taping can absorb some of the shock or impact and change the angle the forces are transmitted through the tendon. It can be worn all the time if the knee is painful. A full neoprene knee support can keep the tendon warm and support the whole joint. It may be trial and error to see which type works best for you. Rest is the most important element of treatment. Only do as much exercise as it will allow without causing pain. Weight-bearing exercise will make it worse. Keep your sessions few and lower impacts rather than training every day. Switch high impact exercise to swimming or cycling if pain allows. A plaster cast can be applied for three weeks if the pain is severe. Ice – Apply ice or a cold therapy wrap to the knee regularly throughout the day and particularly following activity or sport. Ice should be applied at least three times a day for 10 to 15 minutes. If the injury is particularly painful then ice can be applied for 10 minutes every hour. Ice massage with an ice cube is another convenient way to apply cold therapy to a specific area such as the patella tendon. Keep the ice moving as applying directly to the skin can cause ice burns. Compression in the form of an elastic support or wrap can help support the area and reduce swelling. Read more on PRICE principles. A Doctor may prescribe NSAID’s or anti-inflammatory medication such as Ibuprofen to help reduce pain and inflammation, although this is not good to rely on long-term or mask how bad the condition actually is. Athletes with asthma or other contraindications should not take Ibuprofen, always take your Doctors advice before taking medication. Once normal daily activities are pain-free then gentle stretching exercises may be beneficial along with sports massage for the quadriceps and myofascial release techniques to help stretch the muscles can help ensure they are strong enough to cope with the loads placed on them as well as not being too tight. Massage should not be applied directly to the tibial tuberosity where the patella tendon inserts as this are likely to make symptoms worse. Gentle stretching exercises, particularly for the quadriceps muscles can be done as soon as pain allows. If the bones of the young athlete have grown quickly during a growth spurt and the thigh muscles have not yet caught up then lengthening them through stretching exercises can help reduce the strain on tendon insertion into the bone. The quadriceps muscles at the front of the thigh attach via the knee cap or patella and patella tendon to the tibia or shin bone at the tibial tuberosity. Gently stretching the quad muscles may help in the treatment of Osgood Schlatters disease although it must be done slowly and gradually. If stretching is painful, it should not be performed. Too much stretching when it is not necessary could make the condition worse. Lie on your front and bend the knee so that the foot moves towards the buttock. Use a hand to pull the foot closer, until you can feel a stretch at the front of the thigh. Hold the position for 20-30 seconds, pulling the foot closer if the stretching feeling fades. Stand next to a wall or something you can hold on to. Bend the knee of the leg you wish to stretch and pull the foot towards your buttock. When you can feel a slight stretch, hold this position for 20-30 seconds. If the stretch feeling fades, pull the foot further in, or tilt the hips backwards. The most important thing is the management of the athletes training program so they can do as much exercise as pain will allow, which may mean focusing on quality rather than quantity. It may just be a case of waiting until the athlete stops growing so fast and the tendons and bones become stronger. A big part of managing the condition is educating the patient, parents, and coaches about the condition and the importance of not overtraining. It is important to manage the young athletes training program so they only do what pain will allow. If this means training just once or twice a week then so be it. They will make more progress with one or two quality sessions as opposed to daily training where lack of progress and frustration is the outcome. What often happens is the pain will settle down, then the athlete goes back to the usual levels of training. Then it will get to a stage again where it is inflamed and you will need to rest and calm it down again. That will be the pattern that quite a few children will do for years and years. They can still get enough training done so they can improve technically so they still have a chance of making it as a professional sportsperson. But if you keep pushing and pushing and ignore it then you might end up with a situation where it is so painful that you could miss 12 months or more of training and that they could end the chances of that child achieving a career in professional sport.